The factional leadership of the Peoples Democratic Party (PDP) led by Senator Ali Modu Sheriff has said it would not accept the decision of the Independent National Electoral Commission (INEC) to recognise Pastor Osagie Ize-Iyamu as the party’s candidate for the Edo State governorship election. Sheriff’s position came just as the Chairman of the PDP National Caretaker Committee, Senator Ahmed Makarfi, stated that it has not foreclosed the chances of reaching a peace accord with the aggrieved group despite successes so far recorded by the party at the courts. Also, the caretaker committee has said as part of its effort to quickly deliver on its mandate, it would hold a stakeholders’ meeting of the party yesterday to consider the possibility of fixing a fresh national convention within the next 90 days. While addressing a youth group, the Young Professionals from the South-South, which came on a solidarity visit to Sheriff, the former National Vice Chairman of PDP (South-South), Dr. Cairo Ojuogboh, said the group remains the true leadership of the PDP, and that the report of INEC’s recognition of the Makarfi-led national caretaker committee of the party was a mere rumour. Ojuogboh said: “We hear a rumour making rounds that INEC has accepted another person as candidate of the PDP for the September 10 Edo State governorship election. Ojuogboh who was flanked at the event by the former presidential aide, Ali Ahmed Gulak, further said their candidate, Hon. Matthew Iduoriyekemwen, will push on with his campaign to contest for the governorship election. 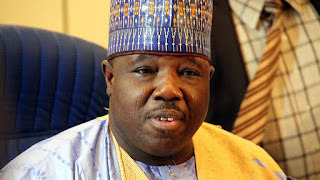 “As we speak, the orders of the federal high court in Abuja specifically asked INEC to recognise only candidates presented by Sheriff as national chairman of the party. “The court in Port Harcourt is not superior to the court in Abuja. And as such, cannot reverse the specific orders of the Abuja court ruling that INEC can only accept PDP candidates from Sheriff leadership for purposes of Edo and Ondo States governorship elections. But Senator Makarfi-led leadership of the PDP appeared not to be perturbed by the outburst from the Sheriff’s camp as they went ahead to receive a delegation of prominent leaders of the party from the North-west geopolitical zone wednesday. The North-west party leaders which included zonal officers and state chairmen of the PDP said they were on a solidarity visit to reassure the caretaker committee of their full support in the effort to reposition the party affairs. Speaking during a brief ceremony at the temporary operational base of the committee in Wuse II, Abuja, Makarfi said the party still prefers a reconciliatory approach to resolving the current crisis to litigations. He said the caretaker committee would try as much as possible to avoid engaging on war of words with the aggrieved faction led by Sheriff. “So far, all legal intervention has been in favour of the decisions of the Port Harcourt national convention. That is not to say that the job is finished. In the past I have said severally that the path of peace and reconciliation is the best path. “Litigation can resolve issues on legal grounds but not between brothers and sisters. We will never foreclose that window, even if the legal issue is terminated at this stage. If the legal issue continues, we will not foreclose the window of reconciliation,” he stated.